Thanks for the good job on the Jeep. Hi Lindsay thanks for detailing my ute. Thanks Lindsay you did a fantastic job on my car it looks Brilliant. You have my highest recommendations and I would not go elsewhere. My darling and I would like to thank you for the wonderful job you did on her car, when we were with you in your office and my darling who was not sure what she actually wanted I thought you showed a fine degree of patience with her and helped guide her to the excellent design that is now displayed on her car.. Lindsay from go to woe dealing with you was a very happy time for us thanks for the quality of your workmanship its great. We would recommend you to all our friends. Regards Honey and Graham Collins..
Hello Lindsay, I just wanted to offer a brief word of thanks for the outstanding work on my car yesterday. I particularly appreciated your meticulous attention to the smallest detail and the brilliant finish to all surfaces. The result is absolutely superb. Also, I would like to thank you for all the tips and professional advice on how to care for my car better, which products to use and which techniques work best. I am grateful for knowledge generously given. And lastly, I know that after hours of careful work on my car to ensure tht everything was perfectly completed, your fee was modest and very reasonable. and that I feel totally satisfied – worth every cent. Thanks Lindsay car looks Great!! I love your feedback, I take great pride in my work and the results I get are based on my observation of the job on hand. I do not run to a clock, instead I rely on my eyes guiding me to achieve the best result for my clients precious cars. Here a few testimonials from some car detailing and Vinyl Stickers Graphic and signage Services performed in the Perth metropolitan area. I recommend Lindsay for car detailing. Lindsay puts in 110% every time, with every job and there is no slap dash that will do work here! His prices are very competitive, he takes his time and you will get extremely good value for money. In saying that he is not a miracle worker but he is a perfectionist. Good honest value for money and customer service is what you can expect. Only the best quality products are used and you can get anything from a basic detail to a full makeover including shampooed seats and carpets etc… I did and it transformed my car. He is self employed and relies heavily on personal recommendations as well as repeat business. There are plenty out there who will take your money and do a fraction of the job with cheap products but NOT with Lindsay. His web address is www.autorevive.com.au If you are wanting a car detail to sell your car (ususally once he has completed a detail the car sells within 24 hours) or just a seasonal spruce up to protect your car, even as a gift then give him a call on 0408 938 457. Lindsay is a car enthusiast and having won many car show awards over the years and that same dedication will be shown when details a car for you. Ive been meaning to get mats for some time now. I think now is a better time than ever! has been using Auto Revive for about a year for the company cars and our staff’s own vehicles. Lindsay does a great job on the cars and always provides us with excellent service. Applecross Safety Solutions has been using Auto Revive for just over a year for the company cars and our staff’s own vehicles. Lindsay does a great job on the cars and always provides us with excellent service. Thanks again, I have already told a number of my friends how great and well-priced your services are. Thanks again for such a great job you did on my car. Will use you in the future. Thank you so much for your fantastic customer care. and I have already recommended you to many of my friends. Need a spring clean on the car? Need to freshen up your vehicle before you sell it, and get a better price? Need to get Coogee’s paint of your pride and joy……!!!!! 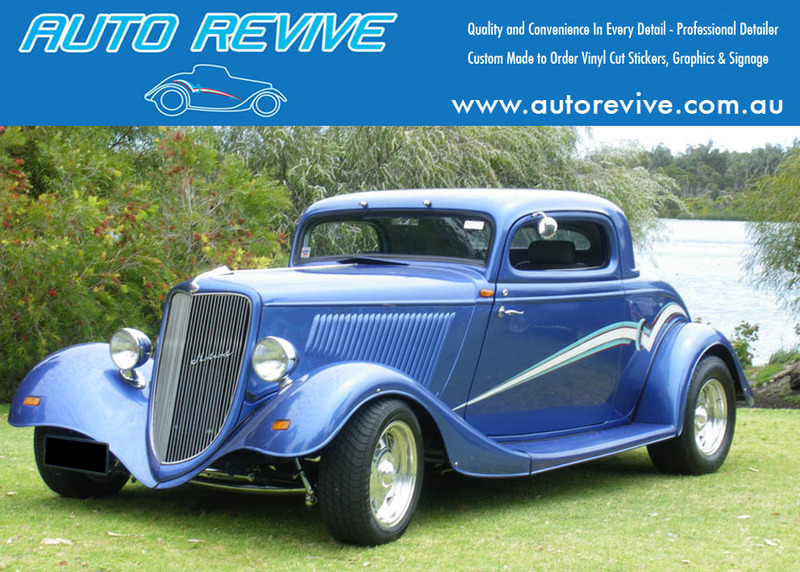 Contact Auto Revive on 0408 938 457. Mention my name and the price goes up!!! Seriously if you are looking for a bloody good car detailer give Lindsay a call. P.S. Lindsay got the paint of my car – check it out next time its parked out front. Thank you for the great job on my car. I’m ecstatic how well the Interiors and Exteriors has come up. The car detailing jobs you have done for me in the past have been excellent.